Hi, I am interested in your 1955 Chevrolet Bel Air (stock #5071-CHA) listed on Autotrader for $70,995. I'd like to get more information about this vehicle and confirm its availability. 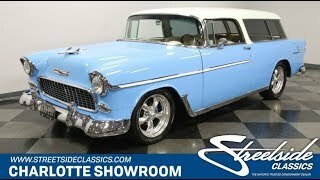 The 1955 Chevrolet Nomad is the ultimate grocery-getter. After all, these were rare, expensive, and powerful when new, and it only gets better in a low mileage example that that has been improved in every way. The blue with a white roof gives this an instant vintage attraction. But the way the sunlight radiates off this two-tone instantly lets you know youre looking at a high-quality modern clearcoat application. But the star of a first-year Nomad is truly the brightwork. These are always distinctive up front with the wide grille, even wider bumper, and jet-inspired hood ornament. Along the side, the 1955s exclusive trim line that starts behind the headlight and runs through the door line works particularly well here. Not only does it highlight how straight these the body panels are on this carefully restored classic, but also the white streak within the trim adds to the two-tone attitude. It all ends with another wraparound bumper and the seven protective slates that really just help to highlight the sporty slope of the hatch. So you can really tell someone took the time and money to get this car right. This level of care makes sense. Rarely do you find an actual miles Nomad, especially one that has averaged less than 900 miles annually. Inside they made plenty more investments to make this comfortable in modern times, but it also never loses that vintage attitude. For example, you still get the classic two rows of wide bench seats, but now its a custom setup with comfy cloth inserts for where you sit. And these seats set up a nice color theme thats continued on the side panels, carpeting, headliner, and in the rear cargo area. You get other great comfort upgrades like a cup holder center console, power windows, AM/FM/CD stereo, and cold R134a air conditioning. Youll slip behind a wood-rimmed sports steering wheel mounded on a chrome tilt column, and this gives you a commanding view of the classic gauges and the road ahead. The 55 Nomad was the first year for the small block V8. This one celebrates that legend with a younger and larger V8 thats dressed to impress. The 350 cubic-inch crate motor looks terrific with polished components like the valve covers, compressor, alternator, breather, shroud, and much more. Plus, with the smooth painted firewall and tidy overall setup, this one is ready to show off. The V8 fires up nicely and makes a sweet sound out of the dual exhaust. And because this is a car that youll want to show off everywhere they also upgraded the driving experience. A three-speed automatic transmission, power steering, front disc brakes, and a newer front sway bar with upgraded bushings make this a fantastic cruiser. Those larger 17-inch American Racing Torq Thrust wheels allow for grippy modern tires. This is the icon restored with all the right pieces to turn heads and keep you comfortable. So if you love driving your classics, dont let this first-year Nomad slip away. Call now!